This PDF 1.6 document has been generated by QuarkXPress(R) 9.1, and has been sent on pdf-archive.com on 16/10/2014 at 15:30, from IP address 193.63.x.x. The current document download page has been viewed 250 times. File size: 91 KB (4 pages). 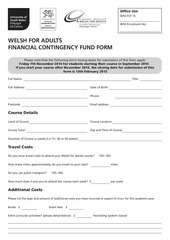 Do you incur travel costs to attend your Welsh for Adults course? How many miles, approximately, do you travel to your class? Do you incur childcare costs to attend your Welsh for Adults course? If so, how much does childcare cost each week to enable you to attend this course? payment or letter of confirmation from your childcare provider. If YES, you must provide proof of your entitlement by supplying a copy of the relevant benefits letter. of this with application form, you do not have to provide statements. Money Advice Team can identify that it is your bank statement. fund will be paid into the first account listed and this must therefore be an account in your name or a joint account. You must ensure that you have read and understood the terms &amp; conditions and the Data Protection Statement. outcome of this application. I understand fully that awards are not guaranteed. an item is missing or incorrect my application will be delayed or rejected. undertake full legal responsibility for it. • I will inform you immediately of any alterations to the particulars given. the terms of the data protection act 1998. • I undertake to repay any amount awarded which is subsequently found to be based on inaccurate information. application and any award from the University of South Wales in order to assess my entitlement to benefits. • I undertake to repay any amount that is awarded to me in error. for Work and Pensions have the power to access information from your application for processing benefit claims. Explicit consent will be sought if the information is requested from any other source or for any other purpose. This file has been shared by a user of PDF Archive. Document ID: 00189349.